Mini frames with knitted covers, mini frames, covers for mini frames, micro rollers, hot dog rollers, hot dog paint rollers, Wooster Mini-Koters®. This 1/4" size roller is available from two different manufacturers. The mini refers to Wooster Mini-Koters. The micro rollers shown below, refers to an imported line. The mini and micro lines are not interchangeable. If you order the mini covers you need to order the mini frames. Larger diameter covers available on the Short nap covers , Long nap covers , and Roller covers and frames, ¾" size pages. 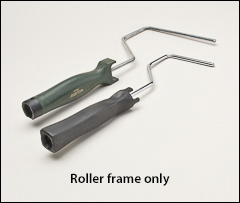 Wooster Mini-Koter frames feature short handles that are great for resin wet out on small or hard to reach areas. A3190 and A3190A have plastic, threaded grips and work with 4" or 6" covers. A3192 has a polypropylene threaded grip (Sherlock GT compatible) for 6" covers only. Sold by the pack, 12/pack. Wooster Mini-Koter covers are available in woven or knitted fabric or foam. Depending on the material type, covers can be used with enamels, varnishes, polyurethanes, resins, epoxies, flat paints, stains and sealers. Available in 4" or 6" widths. All have polypropylene cores and a closed end that saves time when painting corners. Sold by the box, 24/box. 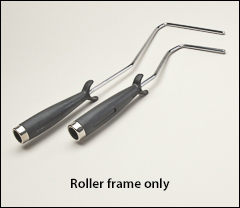 The following covers and frames are not interchangeable with the Wooster Mini rollers shown above. These are an imported line of 1/4" size rollers. Assembled and ready to go. These units offer a confined area versatility with their narrow diameter. All have plastic cores. Sold by the pack. A3465 and A3466 are 6/pack. All others are 12/pack. Micro roller frames are the best choice for small or hard to reach places. Four different overall lengths in two different widths. Sold by the pack, 12/pack. WARNING: Proposition 65 Label for A3184 . Micro roller covers are available in a woven (shed-resistant) Perlon fabric, or foam. Both are available in 4" or 6 1/2" widths. All covers below have a plastic core. 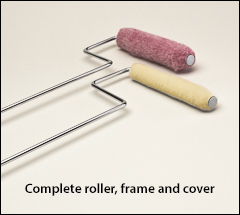 Fabric roller covers are used for general purpose painting. Foam covers are used for enamels and clear finishes. Sold by the pack. 1/4", 3/8", and 1/2" fabric covers are 12/pack. 3/4" fabric covers and foam covers are 10/pack.